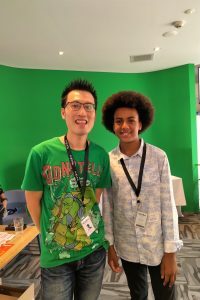 Somerset Storyfest 2019: Slimed and Dunked! 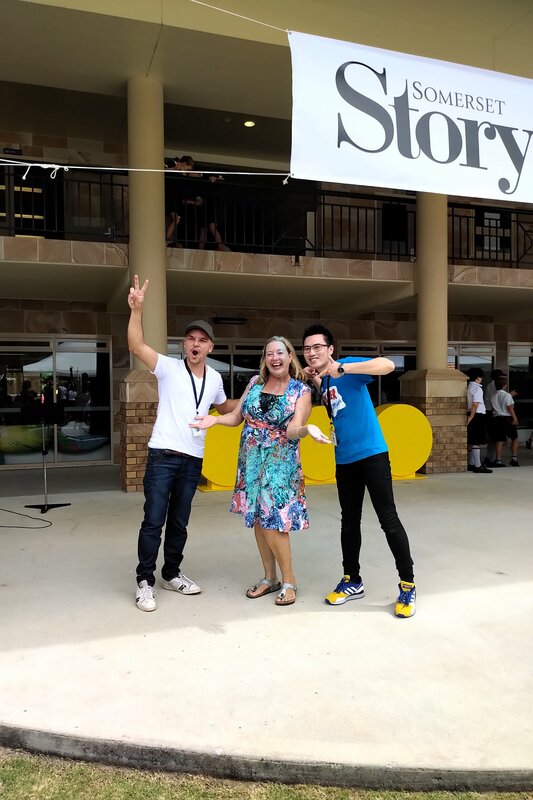 I’ve just come back from a week up in the Gold Coast, attending the wonderful Somerset Storyfest, a kids-lit festival that has set the standard for all other similar festivals around Australia. 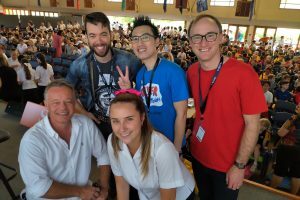 The scope for Storyfest has outgrown it’s initial ambitions of being a literary festival set on Somerset College, and wants to be a year-long Celebration of literature for the whole Gold Coast region. Yet, despite the scope of this new name and aim, the vibes at Somerset College are still the same, it’s sunshiny, laid-back and buzzing. Guests are treated like rock stars. Tristan Bancks, Belinda Murrell and I were game for some fundraisers for Room To Read, a charity cause to help educate girls around the world. I’ve been an Room To Read author ambassador for 8 years now, and I’ve been involved in wine nights, City 2 Surf walks and selling badges. But when Tristan suggested slime, I was keen. To get Belinda on board was even more cooler since she would have been the last person I thought to want to have slime all over you. Yet she was cool about it all as she was the first to get hit with the goo. 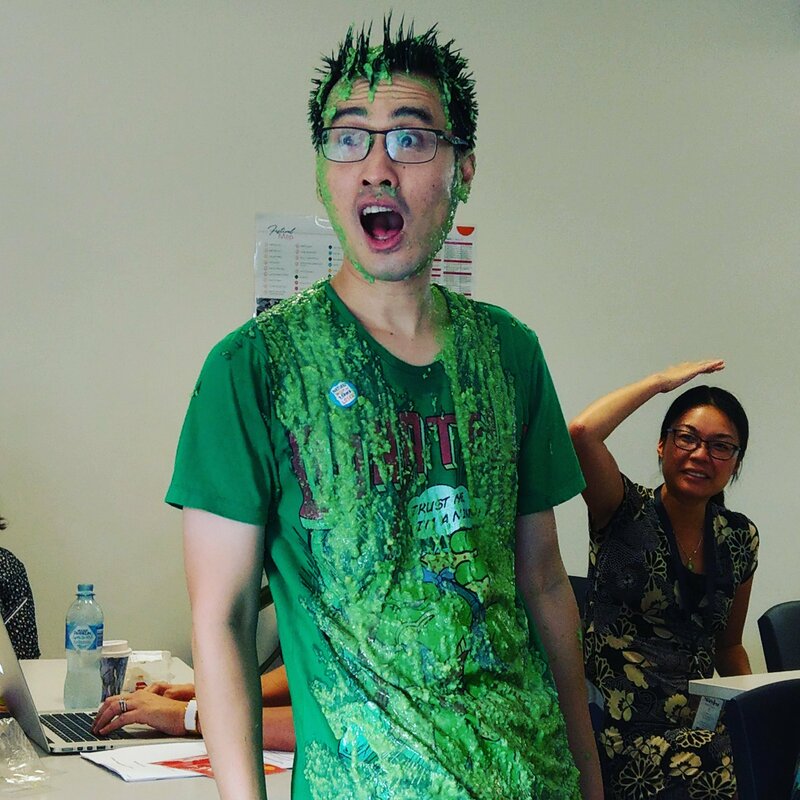 My enthusiasm for the slimeing was diminished when I realised that this slime was not gooey like the Nickelodeon Awards slime, but clumpy and claggy. Eeeeek! What would it do to my hair? On Thursday, we all found out and well…my hair was still as Kim Kane called it, peak spike. Storyfest continues to have an outstanding mix of old (ahem…that’s me now I guess being a threepeat guest) and fresh voices. It’s more than just fiction too. They also had Pete Sergant, who spoke about financial security and tips, as well as Jerome Doraisamy who has written books about wellness. I finally got to meet slam-poet wizard Solli Raphael, while I never saw him perform, I know I’ll see him eventually cos he’s going to be around for a long time. Oh, and I also got to meet Bren MacDibble who has written a future classic, The Dog Runner, set in the same kinda world as How To Bee. I picked it up, along with Karen Foxlee’s acclaimed Lenny’s Book of Everything. Best thing about Storyfest is that authors are pampered, looked after well. We only do 2 sessions a day, which means that we can watch other authors do their thang. You really do learn so much from hearing other authors. I bring my laptop along and treat it like it’s a live podcast hehe. 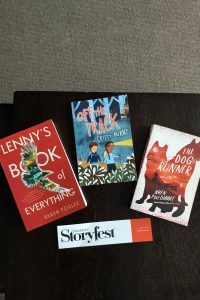 Storyfest is one of those weeks where you feel fortunate to be a kids writer and a part of the kids lit community.